Yesterday I went back to the studio to work on this self-portrait. This is how it looked when it was time to pack up and go home. I was NOT happy with it at that point because I felt I was already losing the likeness, but I was out of time and had to stop for the day. I had started the session by working on the mouth, and in fact I was happy with that. Then I had started working on the eyes, but something was off and I didn't know why. Although I didn't have a likeness, I was getting a family resemblance. Well, this has happened to me before while doing a portrait. When I am painting someone I know, sometimes I get a general family resemblance before I get a likeness, so I recognize the person's mother or the person's son. That just means I am on the right track. But the experience can be a lot more powerful in a self-portrait and it can be unsettling to "recognize" your relatives (alive and not) when you look at yourself. I think I made changes in response to that feeling, rather than to observation of my reference photo. The result is that this image doesn't really look like me, but it does look like some of my relatives. Well, that is how it goes sometimes. 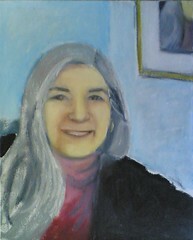 Although I was frustrated when I left the studio, I was pretty sure I would be able to get the painting back on track. Once I got home and could see the image on the computer, I realized that the placement of the features was off. I thought I knew what to do about it, so I tried out my idea with a digital overlay. But that is tomorrow's post. To be continued. . . .